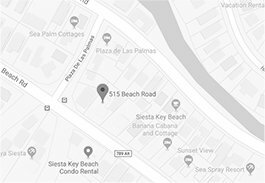 How far away is the beach access from the Inn on Siesta Key? 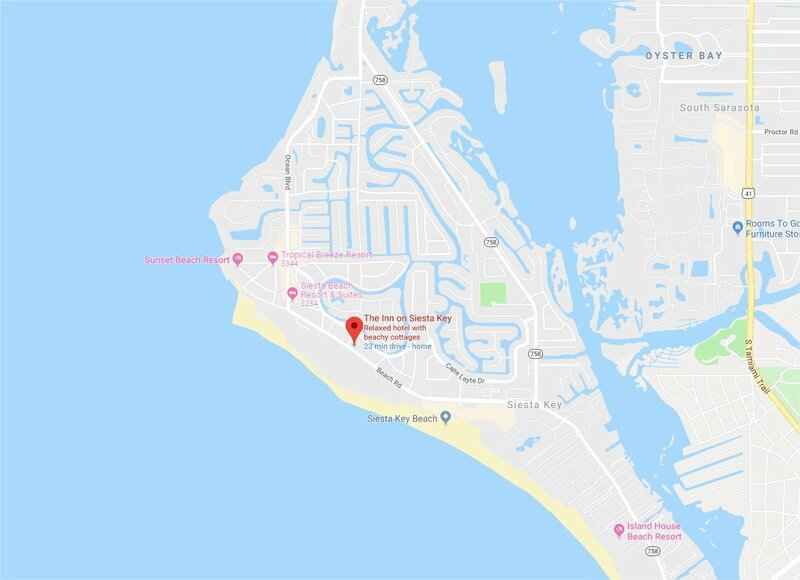 The beaches on Siesta Key are some of the finest in the world and many of our guests are surprised to learn that Beach Access #9 is just across the road from the Inn on Siesta Key. So getting to the beach is a breeze! Please refer to the map below. We also have free beach chairs and umbrellas for you to use while staying at the Inn on Siesta Key! How close are you to Siesta Village? Siesta Village is only a 5 minute walk from the Inn on Siesta Key. The village has a charming beach vibe and is filled with restaurants, pubs, ice cream parlors, gift shops and even day spas. At night, the village comes alive with live music, so there’s something for everyone. What will the weather be like? When is the best time to visit? Siesta Key and the surrounding Sarasota area is blessed to have some of the best weather in the country. However, mother nature has a mind of her own and, like anywhere else, isn’t always predictable. Please check sites like weather.com or accuweather.com for forecasts. What types of amenities are provided in the rooms? We have all sorts of amenities for our guests. Please check out our amenities page here. 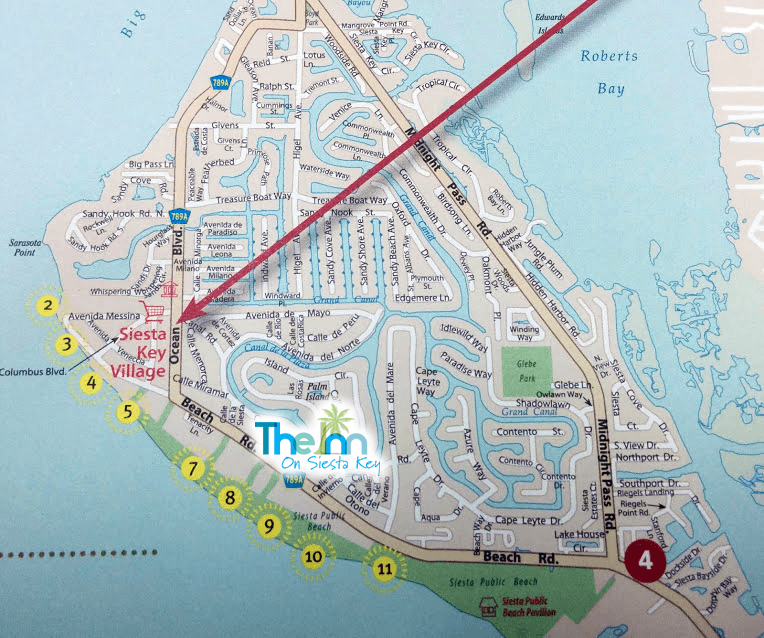 The Inn on Siesta Key provides free onsite parking for its guests. Yes, our pool is heated during the winter months. Yes, we do have free wifi for our guests. Please ask for the password when you arrive. What are your bed sizes? Our bed sizes are listed in each room’s description. Please note, we do not have sofa beds, but we do have blow-up mattresses for additional guests. Please inquire if you have any questions. What are some of the other things to do in the area? We are blessed to have so many things to see and do here in the Sarasota area, the list would be endless. There are wonderful shops, restaurants, cultural events and site seeing opportunities virtually everywhere. However, we do recommend two free things that many enjoy. Every Monday, the famous Ringling Museum is free to the public. Another treat, every Sunday evening (weather permitting) just before sunset, a community drum circle plays at the Siesta Key Beach. This isn’t a commercial event, but a local experience that has taken a life of its own and is a great time and suitable for all ages.